The FC and I finally made our first big “renovation purchase” on the new cottage: the windows. We chose simple but classic black guillotines (no fake panes) and two modern black doors with full length glass windows. The cost will be $1000 under our initial budget. (Yay!) Though the pressure (and cost) is mounting, the relationship is holding strong. Touch wood. Speaking of wood, besides the leaky roof (which we can’t evaluate until the snow clears) another big choice is flooring. We’ve decided to install hard wood throughout, and though we know any wood will be great we still want to pick the perfect one, the one that will bring out the cottage’s very best (as the FC brings out mine.) We want the wood floors to make fast friends with our furniture, snuggle up with our throw rugs, inspire our walls and make love to our open-concept kitchen. We want Nirvana in a floor, that’s what we want. Last night while visiting a wholesale outlet, we fell for the Jatoba hardwood and its patchwork quilt of light wheat colours and warm reddish browns. (Apparently these are the natural colours of the wood, it’s not stained. But it says Brazillian. Does that mean rainforest? That can’t be good, right? Best to stay local.) 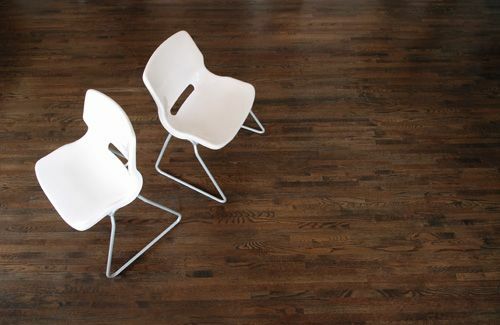 I’m also into light maple because it’s airy and bright and the neutralness goes well with other wood furnishing. But my friend Brent, who’s decorative taste always impresses me, champions an extreme dark stain (like a coffee oak) arguing that it reflects light, so I now find myself in a war of the woods. This entry was posted on Friday, January 29th, 2010 at 6:03 pm	and is filed under Uncategorized. You can follow any responses to this entry through the RSS 2.0 feed. You can leave a response, or trackback from your own site.